Sadly what Patterson says is mostly true. We are failing our children. Badly. 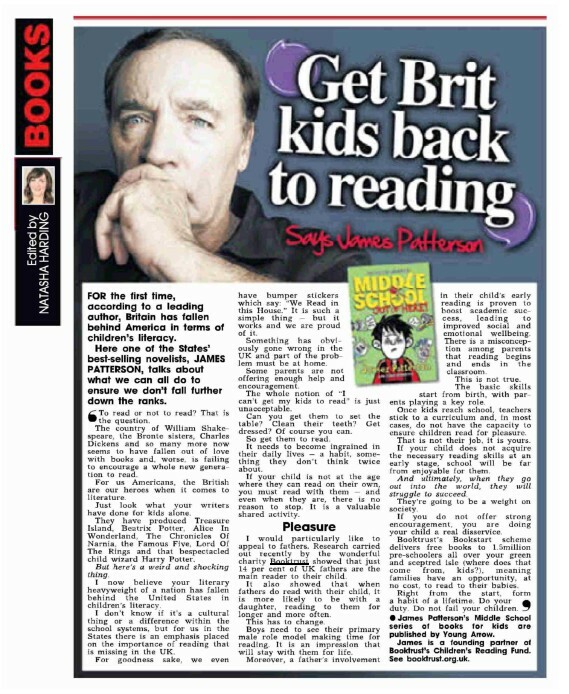 But though there is most definitely a proportion of parents who are not interested in supporting their children’s reading and conveying a positive attitude towards books themselves, there are also plenty who do try very hard. Over the last twenty years, Bookstart has encouraged parents to share books with their children and cultivate a love of reading. But what happens when children start full-time education? There, there is little or no time for enjoying stories for enjoyment’s sake. It might still happen in Infant schools, but it becomes increasingly rare in Junior schools. Hence children arrive in senior school often out of the habit of reading for pleasure at all. So yes, parents have a responsibility, of course they do. But let’s not have school undo all the good work that parents do by making reading a chore, or worse, another subject that children are assessed on.